Snap Inc., the parent company of the popular Snapchat app, has officially filed the paperwork required to go public in an offering expected to raise up to $3 billion. 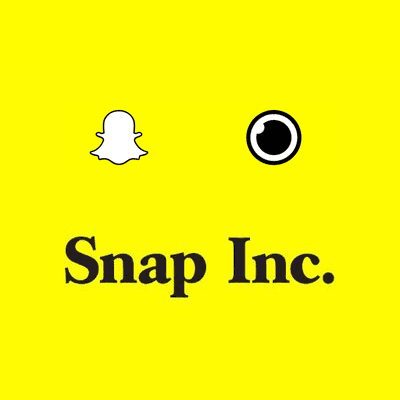 Characterizing itself as a “camera company” that has reinvented the way in which people will live and communicate, the S-1 filing provides a great deal of information regarding Snapchat’s five year history and meteoric rise in active daily users. From a standing start, the company has reached an average daily user base of 158 million people who create over 2.5 billion pictures or videos called “snaps” every day. The company’s success in attracting users was accomplished initially by providing a social network where people could share pictures for a very limited amount of time after which point they would disappear. This reduced the friction usually involved in sharing photos because people did not have to worry about potentially unflattering (or compromising) pictures remaining alive for years or decades. Predictably, young people were attracted to the platform. To build the user base further, the company added video capabilities, enabled “filters” and other features that allowed for playful renditions of images, implemented “stories” to encourage viewing of multiple photos, and allowed for “memories” to be persistently stored by users who wanted to keep their photos and videos for posterity. With 158 million users worldwide, Snapchat clearly has quite a bit of room to grow, although management notes that the rate of growth is likely to slow from the very rapid increases in recent years. The business model generates revenue through creative forms of advertising, and management sees significant opportunities to tap into a growing pool of advertising spending targeting mobile devices. The filing estimates that worldwide advertising spending is projected to grow from $652 billion in 2016 to $767 billion in 2020, with mobile advertising expected to nearly triple from $66 billion in 2016 to $196 billion in 2020. The business summary of the S-1 provides many insights into the history of the company and management’s philosophy regarding how to develop products and address user needs. In this article, we will not spend much more time discussing the product or business model but instead focus our attention on what the offering might suggest in terms of overall market sentiment. Specifically, we will look at corporate governance issues, particularly related to the fact that Snap plans to issue non-voting shares to the public. What we will not do is attempt to actually value Snap’s business or predict how the shares might perform. The mood swings of the securities markets resemble the movement of a pendulum. Although the midpoint of its arc best describes the location of the pendulum “on average,” it actually spends very little of its time there. Instead, it is almost always swinging toward or away from the extremes of its arc. But whenever the pendulum is near either extreme, it is inevitable that it will move back toward the midpoint sooner or later. In fact, it is the movement toward an extreme itself that supplies the energy for the swing back. Depending on the mood of the market, conditions are either unfavorable or ripe for companies with short track records to offer shares to the public. During times of unfavorable sentiment, most private companies will try to remain private until conditions improve. Profitable private firms with adequate free cash flow can remain private indefinitely, although outside funds might be desirable for expansion or to provide liquidity for investors of employees. Unprofitable early stage companies could look to the private equity and venture capital markets for liquidity and cash flow to fund operations and growth. From the viewpoint of existing management of an early stage company, going public offers liquidity and potential capital for future growth, but carries a number of burdens that can often outweigh the benefits. Elon Musk’s email to SpaceX employees regarding the downside of going public is a good summary of the pitfalls (for more on Elon Musk, please read this article). Given the downside, the continuing Founder/CEO of a private company would want to ensure that shareholders are receiving full value or more. Snap is expected to raise approximately $3 billion from the initial public offering and the value of the company, based on year-end estimated value of $16.33 per share is about $21 billion. However, the valuation assigned by the market once shares start trading could be significantly higher if investor enthusiasm translates into high demand for the shares. Companies offering shares typically want to leave some room beyond the offering price for shares to “pop” on the first day of trading. This also allows the investment bank that controls allocation of the offering to reward chosen customers with the opportunity to purchase shares at the IPO price and then flip them to the general public one the prices pops up in trading. This has nothing to do with “value” but is pretty typical for IPOs. As a result, we should probably assume that Snap’s valuation will be at least $25 billion once shares start trading. 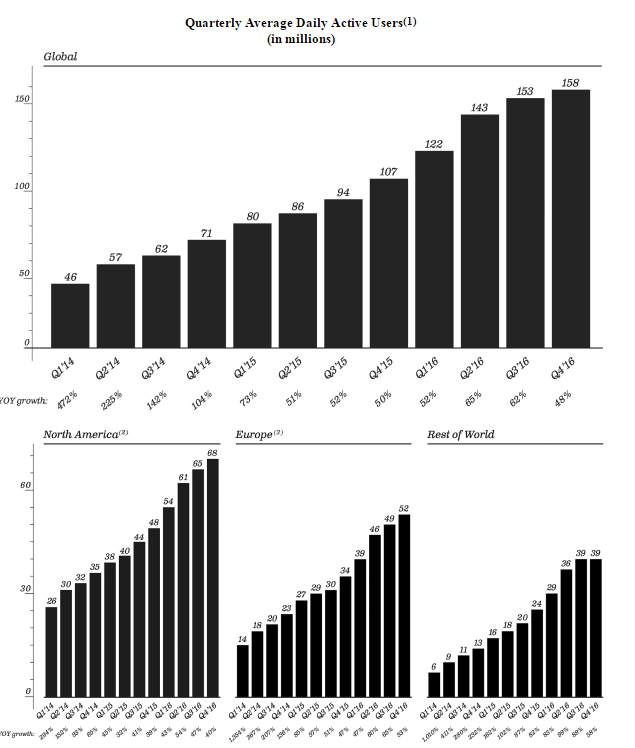 The name of the game in social networks is scale. Once you achieve a certain scale, network effects build momentum and the platform becomes essential for the targeted user base (which in Snap’s case is mostly younger people). In order to build that user base, the product was offered free of charge. However, management started to experience escalating costs of doing business and, quite naturally, decided that there was a need to monetize the platform to make the growth phase of the company’s development at least partially self-sustaining. The initial attempt at monetizing the platform was to adopt a “freemium” model where users were asked to pay for special features such as new “filters”, which are amusing overlays that are applied to photos. However, results were disappointing and few users were willing to pay for this additional functionality. This makes sense given the fact that most competing social networks are free of charge to the user. So management turned its attention to many creative ways of showing advertisements without alienating the user base (the S-1 contains some very interesting information regarding how they went about this). No doubt, the urgency to monetize also was driven by Snap’s desire to prove that the business model can be profitable eventually. Rapidly increasing number of active daily users, although the percentage rate of increase is slowing. Proven ability to begin monetizing users, especially in North America with the same model, presumably, being something that management will deploy in Europe and other developed economies. 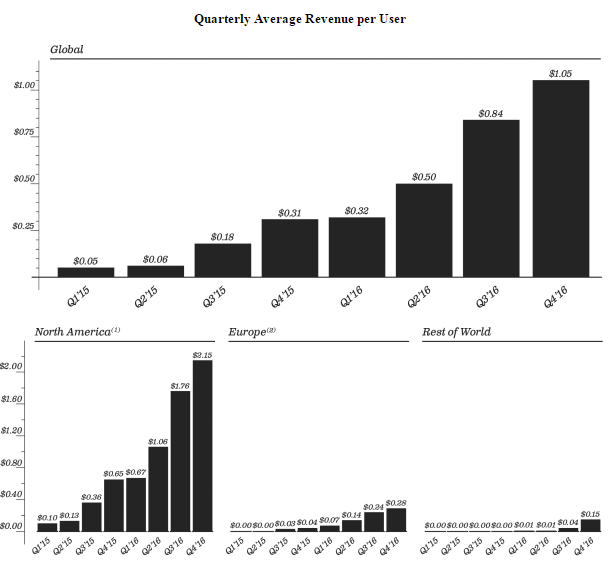 Significant headroom in terms of revenue per active user relative to Facebook. The company has gone from a standing start in 2015 to generating significant revenue by the end of 2016, albeit on an unprofitable basis. Investors who are comfortable evaluating early stage technology companies might, at this point, begin developing financial models and attempt to project when the company will become profitable and what margins might eventually look like. Obviously, it would be simple enough to create a number of spreadsheets forecasting the number of users over time, the average revenue per user, the resulting aggregate revenues, and then making yet more assumptions about the cost structure. This is precisely what the investment banks do and what management will discuss with investors during road shows. It is easy to come up with models that have the aura of precision, but the truth is that no one really knows if or when the company will become profitable or if profitability will ever occur at all. Lacking any means of estimating profitability of the company, it is difficult to even contemplate valuation. One can look at more mature social media companies that are public, such as Twitter or Facebook, and try to figure out what the market might value Snap at in five years but much of this is just speculative. We will make no attempt to value Snap in this article but wanted to at least take a quick look at the drivers of revenue and recent rapid growth to understand the mindset of investors who will be bidding for shares once the company is public. Clearly, very nice castles in the air can be constructed if estimates are justified based on hopes and dreams. The “pendulum” is on the upswing for a $25 billion valuation to even be in the realm of possibility for Snap. Founders Evan Spiegel and Robert Murphy own Class C super-voting shares and, as a result, control the overwhelming majority of the voting power in the company. What is remarkable about this situation is that the founders were able to maintain this level of control throughout the time the company was funded by venture capital. This was accomplished through the issuance of Class B shares to venture investors. In October 2016, the company issued a dividend of one share of Class A non-voting common stock for each Class B and Class C share outstanding. This will further consolidate voting power with the founders in the future as it creates a currency that can be used for further issuance of shares to the public and to employees via equity compensation without diluting voting control. Effectively, the founders have the ability to retain their overwhelming voting control while giving up economic interests in the company over time. The use of dual-class stock is not new and has been used frequently to ensure that the founders of technology companies can retain enough control to ensure that their vision is implemented and to encourage long term thinking. In fact, Google implemented a dual class voting structure when the company went public, as described in the Founder’s 2004 IPO letter. In the case of Google, the Class A shares offered to the public had one vote per share while the Class B shares held predominantly by the founders had ten votes per share. What is new in Snap’s case is the fact that the shares being offered to the public have no voting power whatsoever. As the S-1 warns readers, no doubt driven by legal requirements, this attempt to push the envelope in terms of voting control has been untested in prior IPOs and may result in shares not being valued as highly by the general public. We have no way of knowing whether that will be the case until shares start trading. A Half Century of Control Without Accountability? The founders of Snap are still in their 20s and the share structure they have put in place effectively gives them a lifetime of control over the resources of the corporation without being accountable to other shareholders. There are provisions in the offering that will trigger an automatic conversion of the Class C stock to Class B in the event that either founder dies or their Class C common stock held falls to less than 30 percent of the Class C common stock. However, should either event occur, voting power would be further consolidated with the remaining founder. It is unclear why it would be necessary to provide a large award of RSUs to one of the co-founders of the company who will continue to have every incentive to remain “motivated” to grow the business over time given his level of ownership in the business. Compensation over the past two fiscal years hasn’t exactly been modest, especially for Chief Strategy Officer Imran Khan who was awarded stock with fair value of over $145 million when he was recruited to join the company in 2015. Mr. Khan was previously a Managing Director in the Investment Banking Division at Credit Suisse which happens to be one of the underwriters for the offering. Snap has made remarkable progress in building a social media platform over the past five years and has a large established base of young users which represents a favorable demographic for targeted advertising. Recent trends show that the user base continues to grow while management has successfully begun to monetize that growth. Investors who feel comfortable making longer term projections can make various assumptions regarding the key variables and attempt to justify the likely $25 billion valuation. Snap certainly could “grow into” a company that fully justifies a $25 billion valuation based on fundamentals but, at the moment, that valuation can only be justified based on hopes and dreams. It would be one thing to truly partner with a management team that was committed to expanding the reach of the platform and the financial results of the company over the long run. However, providing funding to a company while having no influence whatsoever in how the company is run is not a true partnership. Furthermore, the need for a founder to receive high levels of compensation to provide additional “motivation” to lead the company is troubling, as is the high level of director and executive compensation for a money-losing firm. As Benjamin Graham often said, there is nothing necessarily wrong or immoral about speculation provided that you recognize what you are doing and that the speculation is intelligent. At the very least, one would have to demand that an intelligent speculation include having some say in the governance of the company, especially if things go wrong in the future. Intelligent speculation does not involve handing a check to a 20-something founder of a technology start up and also acceding to dictatorial powers over the affairs of the corporation, possibly for decades to come. These concerns might not be relevant to someone interested in buying shares in the IPO and flipping them shortly after, but are certainly relevant to a prospective long term investor. The Rational Walk February 3, 2017 February 3, 2017 Featured Articles, Featured Investment Articles, Investing, Snap Inc.